Berber is a branch of the Afroasiatic language family. Since modern Berber languages are relatively homogeneous, the date of the Proto-Berber language from which the modern group is derived was probably comparatively recent, comparable to the age of the Germanic or Romance subfamilies. In contrast, the split of the group from the other Afroasiatic sub-phyla is much earlier, and is therefore sometimes associated with the local Mesolithic Capsian culture. 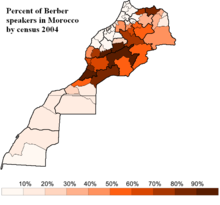 A number of extinct populations are believed to have spoken Afroasiatic languages of the Berber branch. According to Peter Behrens (1981) and Marianne Bechaus-Gerst (2000), linguistic evidence suggests that the peoples of the C-Group culture in present-day southern Egypt and northern Sudan spoke Berber languages. The Nilo-Saharan Nobiin language today contains a number of key pastoralism related loanwords that are of Berber origin, including the terms for sheep and water/Nile. This in turn suggests that the C-Group population — which, along with the Kerma culture, inhabited the Nile valley immediately before the arrival of the first Nubian speakers — spoke Afro-Asiatic languages.